Scientists and environmentalists are concerned that a new technique for generated “supercharged” genetically modified organisms (GMOs) could be misused and trigger a health emergency or natural disaster. The U.S. National Academy of Sciences launched an extensive review last week of gene-drive technology in “non-human” organisms. 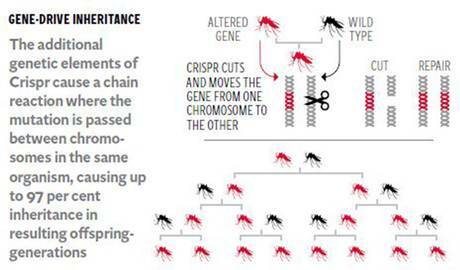 This week, the journal Science will publish a group of 27 leading geneticists’ call on the scientific community to be open and transparent about the ‘risks and benefits’ of gene drives. The researchers have produced a minimum set of safety rules to guard against laboratory escapes. Gene-drive technology is similar to a nuclear chain reaction in that it allows GM genes to be amplified within a breeding population of insects and other animals without any more intervention once the trait has been introduced, including a potentially dangerous one. Lab experiments on fruit flies have shown that a GM gene introduced to just one fly can “infect” nearly every other fly within the breeding population in just a few generations, which defies the normal rules of genetics. 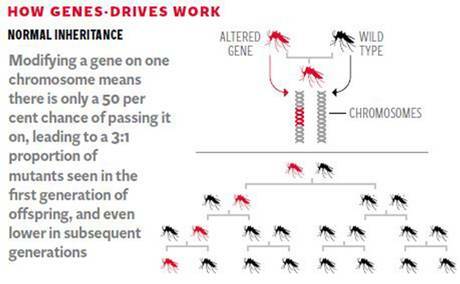 Gene drives rely on a “cassette” of genetic elements that allow a GM gene to jump from one chromosome to another within the same individual with means that within a few generations, all of the sperm or eggs of the animal would carry that GM trait, rather than half. Eventually, none of the animal’s offspring would be free of the trait.